Never heard of “Riddick” or seen any of the previous films? I would recommend to move along and skip it. Briefly I assumed that this was a self-standing SF, not knowing that this was the continuation of two previous movies. Weird, I had never heard of Riddick. For me it was like reading a book written in braille. You can see that there’s something, but you can’t understand anything of it. 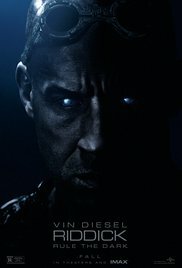 After 20 minutes I had no idea what was actually going on and what Riddick was talking about. I’ll just give my opinion about the way the movie looks and I’ll ignore the story. It would be unfair to judge the movie on that part. The images of the desolate planet where Riddick ended up ( I suppose it was actually the intention to execute him there), looked quite futuristic and menacing. Only thing what bothered me after a while was the predominant orange color. It looked like a stadium full of supporters from Holland at a World Cup football match. A sea of orange hues. The life threatening species looked stunning in terms of computer animation. Especially the hyena-like desert dogs I found a success and the relation (if you can call it that way) that Riddick had with the puppy was sometimes amusing to see. The scorpion-like monsters in the mud, looked convincing in close-up. Only at a distance they looked like rubber-figures. Riddick was a really cool figure who acted like a half-god with those glittering eyes, his apparently invulnerable body and the ability to predict the ending of certain situations. When the bounty hunters land on the planet it all became more interesting. Especially the figure Santana was damn well played with his boastful arrogance and condescending view towards others. The result was a few punches, especially from Dahl, on his tanned face. It’s always amusing when some annoying person gets a good spanking. The systematic elimination of the bounty hunters was entertaining and the climax was the beheading of Santana. A nicely timed and filmed moment. I didn’t think the ending was such a success and looked more like a scene from “Alien” but this time in the Sahara. Furthermore the hover bikes looked like an updated version from those of “Looper“. And the spaceships looked suspiciously the same as those that Zod flew in “Man of Steel“. Don’t know who stole that idea from whom. I wasn’t impressed about the movie. The interaction between the bounty hunters on the one hand and the calculated and cold-blooded Riddick on the other hand were positive. Riddick was sometimes an oracle who could feel how things would work out. Perhaps this was a characteristic of the Riddick himself. The biggest drawback was the lack of knowledge of the prehistory. Perhaps a brief summary at the beginning would have been an option.